Last night Skype quietly updated their iPhone, iPad, and iPod Touch app. We talked about this earlier this week, and now it is here. The new update takes it to version 3.0, and it includes the long awaited 2-way video calling feature. Even if your iOS device doesn’t have a camera, you can still receive video calls though you won’t be able to send them. When you consider the devastating service outage Skype recently suffered, this is a very positive move for the company. 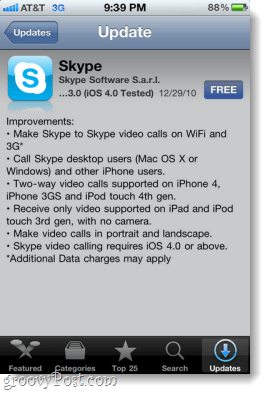 The update comes just in time for New Years eve, which is reportedly Skype’s busiest day of the year. AT&T is bracing itself for impact as the 30 million iPhone Skype users prepare to take video calls over 3G. That’s right, unlike Apple’s FaceTime app, Skype will do video calls on more than just Wi-Fi. Another important thing to note is that iOS Skype users will now be able to call Windows and Mac users. Really great news to kick off the new year!